Three months after, the Annunciation, St. John the Forerunner was born "in a city of Judah," and six months after him Christ Himself was born in Bethlehem. These events are closely bound together. "The glorious conception of the Forerunner proclaimeth beforehand the King Who is to be born of a Virgin" (Exapostilarion, Sept. 23, Feast of the Conception of John the Baptist). 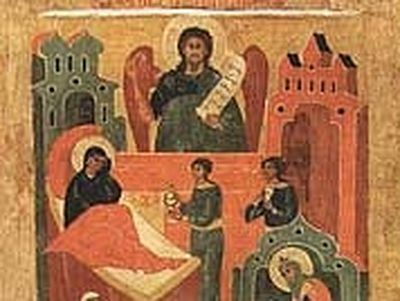 The announcement of the Archangel Gabriel in the Temple, announced later to all living nearby by Zacharias, in the magnificent hymn, which he sang after the birth of the child, John and the restoration to him of the gift of speech (Luke 1:67-79), is the forerunner of the angelic hymn: "Glory to God in the highest;" which was sung in Bethlehem by the angels when they announced to the shepherds the Nativity of Christ. The Nativity of John the Baptist is the first joy sent down by God to the human race, the beginning of its deliverance from the power of the devil, sin and eternal death. It is true that even before the Forerunner, the Most Holy Virgin Mary was born, and angels announced Her birth to Her parents. However, at that time, only Her parents knew of the exalted lot that was prepared for the Virgin Who was born, and they themselves were not fully aware of what had been announced to them beforehand. Therefore, it was only they, who celebrated at the birth of their Daughter, while the rest of the world only later understood the joy that had been announced (to it), by this birth. "The herald of the Sun, the Forerunner" was John the Baptist, who was like the morning star that announces the rising of the Sun of Righteousness in the East. Just as the very event of the Nativity of John the Baptist was the antechamber of the Nativity of our Lord Jesus Christ, so also the feast of the Nativity of John the Forerunner is also the antechamber of the feast of the Nativity of Christ. "The star of stars, the Forerunner, is born on earth today, from a barren womb, John the beloved of God, and manifests the dawning of Christ, the Orient from on high" (Glory at Lauds, of the Feast, June 24). "The whole creation rejoiceth at thy divine nativity: for thou wast shown forth as an earthly angel, O Forerunner and a heavenly man, proclaiming to us, the God of heaven incarnate" (Cantile Five of the Canon). 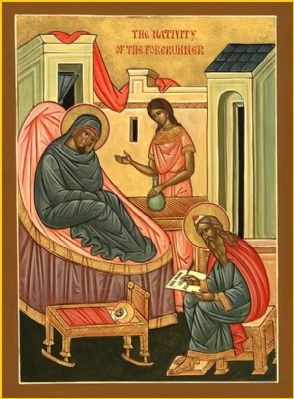 "O Prophet and Forerunner of the coming of Christ, we who venerate thee with love, are in perplexity how worthily to praise thee; for the barrenness of her who bore thee and the dumbness of thy father are loosed by thy glorious and precious nativity, and the incarnation of the Son of God is preached to the world" (Troparion of the Feast). 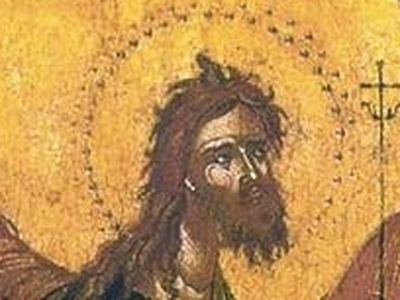 Unfortunately, few of the faithful have recourse to the help of such a lamp of grace as the precious head of St. John the Baptist, “the first among martyrs in grace”. 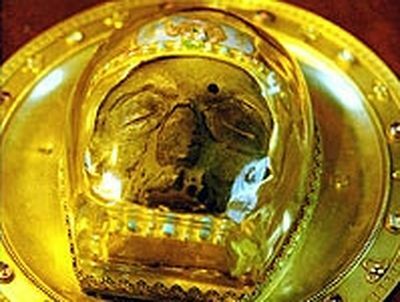 Many Orthodox Christians come to France, but not all of them know how many holy relics there are still on French soil despite the outrages committed against them during the French Revolution and subsequent forgetfulness of France’s Christian past. I write these lines from Mexico Federal District, This Message with shipping occasion of The Nativity Of Remembrance Of Saint John The Baptist. Many congratulations on this date and so special for 3RD WEEK AFTER Pentecost. Very well inform. Thank you. What more can I say? Nothing. Only repeat this saints words in the silence of my heart, thinking and enjoying in myself, asking for Saint John the Baptist and St John of Shangai helping me to have a new self undestanding.